It’s Family Scholarly Culture! …wait…What? This graphic, focusing on success in basic school, shows the reason to change home culture. A very similar one, focused on high school completion is available in the cited article. In a recent research report [i], written by sociologists, the phrase, Family Scholarly Culture, was used to describe the quality of life inside homes where books regularly serve as levers for inserting new ideas and experiences into the ongoing family conversation. This research was conducted in 27 countries (of every economic level and every political persuasion) over a 20 year period. These scientists made comparisons of families using a range of criteria and then statistically matched those up with the records of school success of the family’s children. 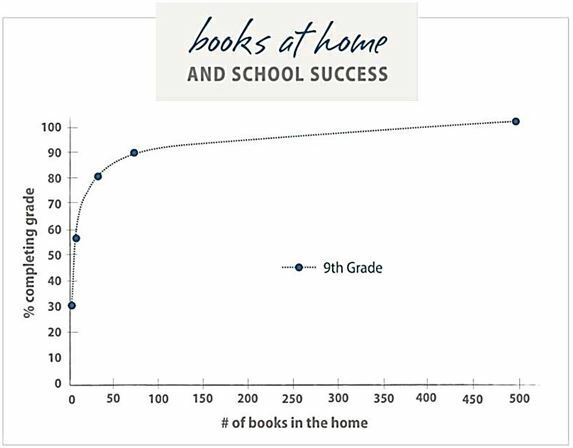 As it turns out, the single best predictor of school success was the number of books in the home. Your first reaction, was predictably that having a pile of books lying around gathering dust certainly won’t have much positive effect upon the school success of the kids. The authors however, divined that the presence of books altered the kind of conversation that goes on in the home. Books carry information, ideas, and vicarious experiences, all couched in interesting language and, more and more these days, are festooned with beautiful graphics, illustrations and photographs. The families that don’t have books don’t have that new and exotic content inserted into their daily lives and thus into their children’s experiences and thinking. Neither do the families that don’t read the books that they do have. However, those families that read and discuss books use that conversation to leverage that content into new ways of thinking, new modes of expression, and new perspectives on life. THAT is why on average, and in 27 very different countries, people with books have better success in school than those that don’t. They have created what these researchers called a solid Family Scholarly Culture. So, according to this research, school success is not, as I had long understood, primarily about money or family income. Families don’t even have to OWN the books they read and discuss, especially if they have a library nearby, or a computer or smartphone that can be used to access new ideas, explore new places and of course read new books. It’s not even mostly about the education of the parents. Sadly, too many so-called well-educated parents don’t read with their children, don’t converse with them about what’s new or interesting, don’t engage their infants and toddlers with song and engage their young ones with chatter as they push them around in a shopping cart. It’s about FAMILY – People who love their children (who doesn’t?) want what’s best for them. If they also understand that the parts of the brain that are stimulated are the parts of the brain that grow and flourish understand, then they get necessity of conversation. It’s about SCHOLARSHIP – which is just another word for thoughtful learning – learning from experts, from direct experience, or from vicariously experiencing the lives of others found in books. Books in this case are catalysts for thinking and talking. It’s about CULTURE – it’s a style of life that consistently permeates interactions in the home – Sharing within the family, talking things over, arguing about ideas, exploring old events and new developments, seeking out new explanations, confronting non-productive patterns of thinking, helping each other UNDERSTAND the world and the place of their family in it. Every home has a culture. Family Scholarly Culture is a very special, fertile kind of culture that prepares children for school success. Consider that any home could create a Family Scholarly Culture. Predictably, it works easiest and best in families where parents and grandparents came from those very kinds of home cultures themselves. However, other families, those that don’t talk to their infants about what is happening, that don’t read to their toddlers, that don’t discuss events in the community with their school age children, could learn to do those things of course. Now, family culture does not change easily. Parents have to be willing to go through what is the very hard work required to change the culture in the home to better set their children up for success. To decide to make such a change, parents have to understand WHY a family might want to change. The answer is, to break what may very well have been a family history of school failure. [i] Evans, M., Kelley, J., Sikorac, J., & Treimand,D. (2010). Family scholarly culture and educational success: Books and schooling in 27 nations. Research in Social Stratification and Mobility 28. 171–197. It is interesting you report that it is books and electronic word sources that bring new ideas into the home for discussion. I wonder about other forms of media such as television and video. Could they not also bring in the same effect? Well, it’s not so much that those information sources don’t offer things to talk about. For one thing, it may just be that those weren’t in the research design 20 years ago when the research began, so they never got figured in. However, other research I’ve read indicates that not only does TV not contribute much to school success, but I’m remembering that there is a negative correlation with TV watching and school success. Somebody help us here. Is my memory accurate? There have been many studies about the effects of television and videos in relation to academic success. Some online sources are http://www.turnoffyourtv.com/healtheducation/readingwriting.html and http://www.livestrong.com/article/496144-how-tv-affects-a-teens-grades. These are research based studies. Thank you, Peggy! A strong addition to the blog. We know what to do. We know what NOT to do. Now if we can just get that word out to parents everywhere!